RCV Ultimate CV Axle Shafts feature ultra high-strength constant velocity joints and 4340 chromoly shafts that are twice as strong as your OEM CV axle shafts. They are rated for oversize tires, high horsepower engines, and aggressive driving, all of which are covered under RCV's unprecedented limited lifetime warranty. CV axle sets includes right and left side CV shafts, SST seals and installation tool, installation instructions, synthetic moly grease, and installation hardware. Black oxide coating is standard with nickel plating available for extra corrosion at an additional cost. 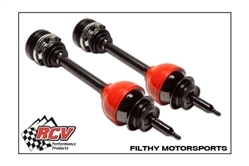 RCV axles are highly recommended by Filthy Motorsports and almost all of our Ultra4 racers, desert racers, and rock bouncers run them. RCV axle shafts feature race-grade 4340 chromoly housings, bearings cages, inner races and axles shafts that have proven in tests to be twice as strong as OEM axle shafts. Even more impressive is that they maintain their strength all the way up to 45 degrees, well beyond the 15 to 20 degree limit of traditional tripod style CV shafts and where they would be at their weakest point. The weak link of tripod style CV axle shafts is that they bind when the angle between the input and output shafts increases which causes the speed of the output shaft to change multiple times during every rotation. This weakness is further exaggerated when you add large tires and more power. RCV has solved these problems with a Rzeppa style CV joint that spreads the torque load over six bearings in a housing that keeps both input and output shafts at equal angles for constant shaft speeds up to an astonishing 45 degrees.